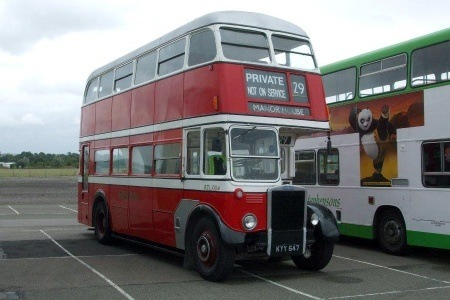 Perhaps this old snap may be of interest as we have had a previous posting of a sister vehicle whist in service with the above fine municipal operator. 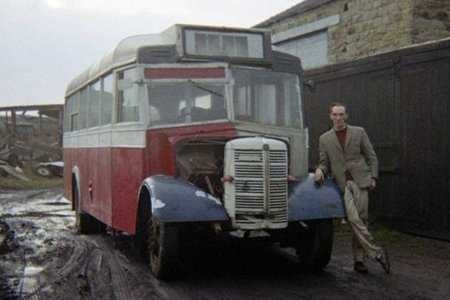 It was taken at Robin Hood on the A61 between Wakefield and Leeds in early 1968. 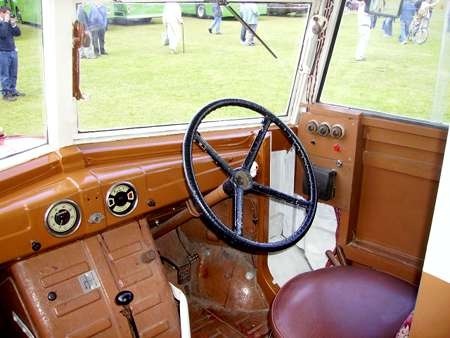 At that time I was involved with a group who were initially preserving the vehicle and I did quite a bit of work on it many weekends, one difficult job in particular was to rebuild the rotting destination box assembly which can be clearly seen here. 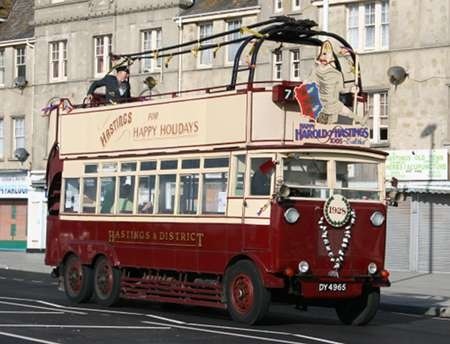 Sadly, due to domestic difficulties, I had to part company with the Group before the vehicle eventually took to the road in fine order and so I never actually rode on it and it was sold on shortly after that. At least your efforts were to some avail in the end! I was comparing my Mulliner-bodied example with your Duple example (and a few others). Superficially, both makes look the same, but the vents either side of the destination box are different, Mulliner having a cover over the apertures. 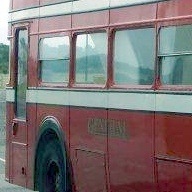 PS Is it you leaning nonchalantly on the front wing – what confidence that it would not collapse from rust corrosion! Yes Chris it is me leaning on the wing – my co- preservationist took the picture on my camera. You are right – it was indeed a risky pose to adopt, but I only weighed about "nine stone wet through" in those misguided heavy smoking days and so that no doubt saved me from an undignified descent into the mud !! We are amazed to hear of the subsequent rebuilding of the body and thanks very much for that additional information. The bus itself, the mud, the dereliction in the background and the look of grim determination on Chris’s face all nicely sum up the early days of preservation, when finding covered accommodation was a nightmare and the transport "professionals" saw us as mad but harmless. Delighted that this project met with such success. 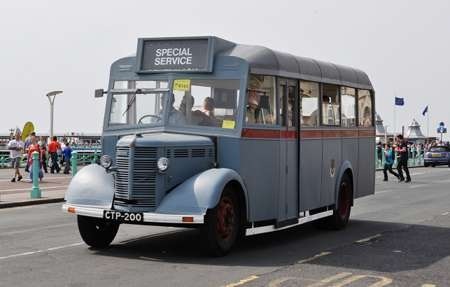 CTP 200 made the HCVS London to Brighton Run today Sunday 1st of May. It is only the 2nd time out on a real run since we got it back on the road after a 10 year period of rest. Apart from identifying a few little jobs to do she performed excellently. Congratulations to Mike and friends on this achievement – my only surviving colleague from the original preservation group will be delighted to hear it. I’ve always been an ardent OWB/OB admirer, both in preservation and in full time public service, and the delightful lusty tones provided by these incredibly gutsy and totally honest little vehicles is music to the ear and comes into my mind very frequently. Nice to hear from you Mike E and hear that she is in safe hands and putting in the occasional ‘public appearance’. Perhaps you could fill in some of the gaps between Chris Y having to give up and near final completions, especially with regard to the Ulster part – how did this happen? 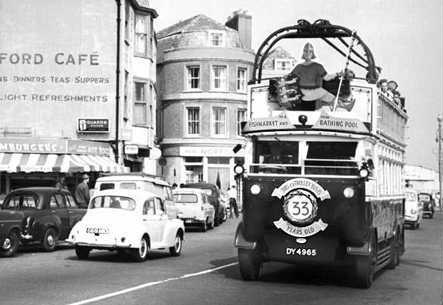 Aside from the engine sounds, I always loved the sounds from Bedford gearboxes of that era – pure music! As I do from time to time I just randomly pick a page – often it helps me to at least try and understand what people are talking about. 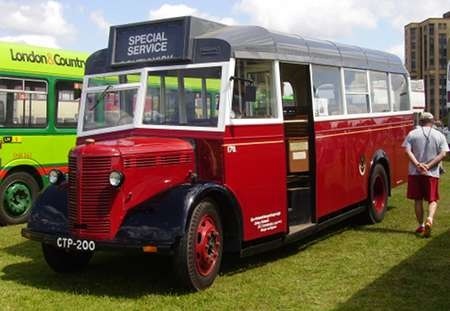 The posting of Portsmouth Corporation 170 registration CTP 200 has a mention of it attending the London to Brighton run in 2011. 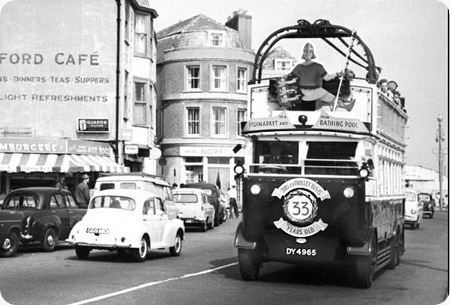 Above is picture taken by me as the vehicle passes Brighton pier. At the moment, she’s having some attention done to the engine and some repainting in the engine bay at the same time. Paintwork has been touched up, with some thought being given to something more extensive. CTP 200 is to shortly have some remedial work done to the front grille, front wings and bumper. 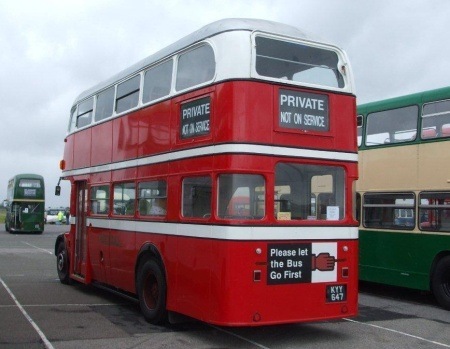 A new rear registration plate is to be made up, the offside half-drop window replaced and the opening windscreen reinstated. Then she will be going away to be painted in the Portsmouth red and white livery, with grey roof. She’s also had to have the engine professionally rebuilt recently, essentially because of a badly scored cylinder bore. The engine bay has, concurrently, had a thorough clean and repaint and the body some touchups. She should be really smart when repainted in maroon, white and grey roof, just as most folk would recall here in service. Incidentally, nice seafront photo of her, Ken J. 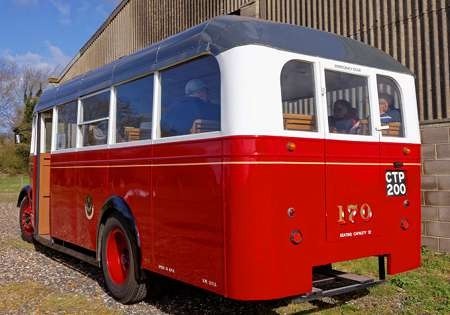 As indicated earlier this restored little bus is now back in it’s true colours of Portsmouth red and white, with a grey roof. 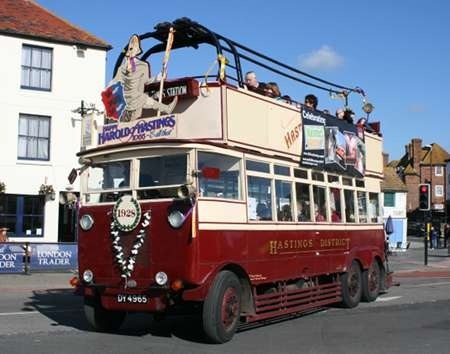 It appeared at the Southdown 100 centenary event at Southsea Common on June 7th. It looked very smart, and drew many admiring looks from both enthusiasts and general public. It’s good to compare this with the original picture on this posting, when it’s restoration was at an early stage. Many man-hours (ladies too?) have passed since then to bring it to it’s smart looks today. Well done to everyone. To complete an all-round view, here are an offside and rear view of CTP 200 (170), taken on its first outing after a recent renovation. 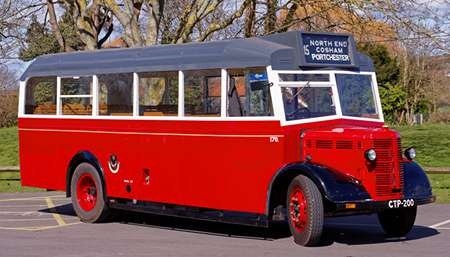 The photos were taken by Kevin Warrington, an active participant in CPPTD, who preserve Portsmouth Corporation vehicles. He allowed these photos to be posted here." Voila! 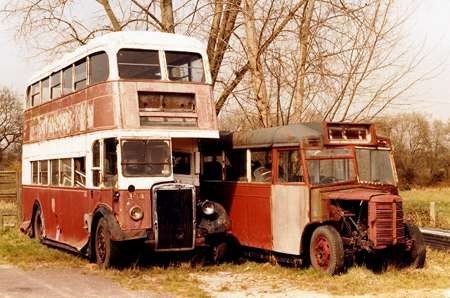 Another pre-restoration photo of CTP200 when first in the hands of CTTPD (City of Portsmouth Preserve Transport Depot): (renovation of the adjacent PD1 is well underway). Thank you Chris. I do remember seeing these two together somewhere near Waltham Chase in the early 1980’s, when taking my sons to band practice. There was never any opportunity to find out more. Now 170 is complete, and it’s good to know that the PD1 is also progressing. 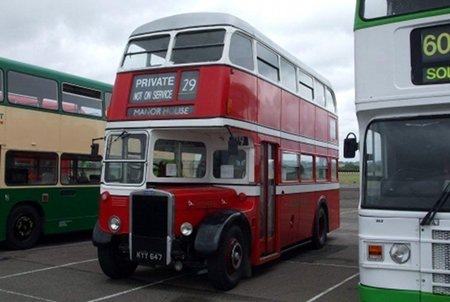 What a tonic to see these two veterans side by side, and grand to know that the Bedford is already "better than new." I’m sure that the gorgeous PD1 will be equally appealing in its own class when completed, and this picture of them standing side by side "in recovery" is delightful.